I have been dying to do something with our entertainment center. I’d love to eventually build this space out to look like a built-in with lots of storage and pretty shelves but that’s not exactly in the budget right now! I have been so tired of trying to keep all of the stuff inside of our entertainment center looking organized and tidy. Landon is constantly opening the doors and jamming his arms down into to try and get stuff out, despite the beautiful (useless) child lock. So, it’s just a mess in there. I decided the best way to fix this issue was to cover the glass. So I pulled out a book of scrapbook paper I already had, picked a few patterns I liked, cut them down, and taped them to the inside. That. Was. It. I had to measure the glass carefully to make sure that nothing overlapped and that the tape stayed on the black part between the panes. The paper is thin enough that the tape shows through if it is on the actual glass but if you have thicker paper – it may not matter! Do you have any budget friendly upgrades that you’ve done to anything in your home? I’m all ears!! I am one of those people who gets the itch to start rearranging and updating every few months – so I need your tips! 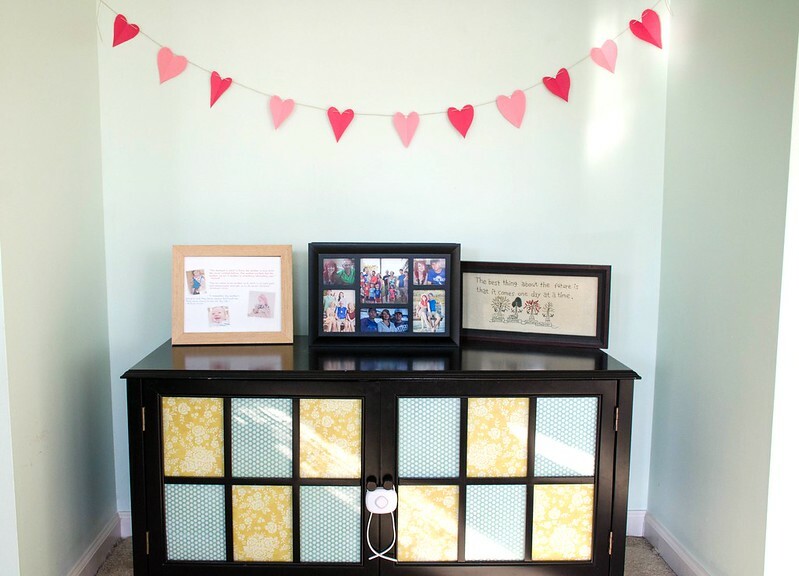 PS: I got a little crazy with Landon’s construction paper and made a heart banner for Valentine’s Day. Also extremely cheap to create and it makes me happy to look at it. I made it “for Landon” but let’s be honest, he doesn’t care, it is really for me. Haha!